Chances are you’ve come across jojoba oil in at least one of your hair products. The natural oil is a popular haircare ingredient because of its numerous properties that benefit hair health—plus the fact that it works effectively with all types of hair. And while it’s common to find on the ingredient list of your favorite natural haircare products, the oil itself is a saving grace for tired strands that need a restorative boost of moisture and nutrients. Below we’ve listed a few of the ways using jojoba oil for hair can be a transformative step in your haircare routine. Whether you're trying to kick-start growing out your hair, seeking to put an end to split ends, combatting dandruff, or simply looking for added smoothness and shine, jojoba oil has the power to deliver results for nearly all your haircare desires. Because of its 98% monounsaturated fat and 2% saturated fat composition, nutrient-rich jojoba oil helps moisturize and condition hair by penetrating the inside of the hair fiber. If applied before washing hair, the oil can help prevent shampoo from stripping your strands of their natural oils. You can also apply jojoba oil after washing, while hair is still damp, to provide a protective coating to each hair shaft. 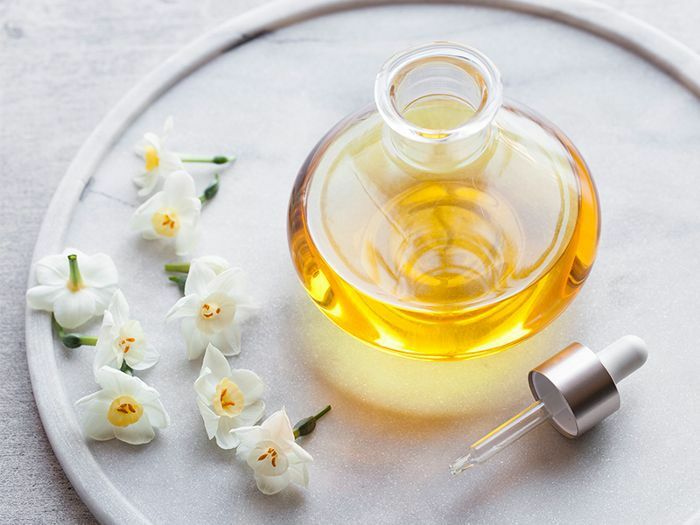 Jojoba oil’s molecular composition is almost identical to human sebum—the oil that acts as the skin’s natural moisture barrier—so it delivers welcome hydration to strands without messing up your scalp's natural balance or leaving behind a greasy residue. Jojoba oil has antibacterial properties, so it controls the growth of bacteria in the hair follicle, reducing the likelihood of dandruff. Because jojoba oil helps to clean the scalp and hair follicles, it can promote hair growth by dissolving buildup by unclogging the follicles and allowing a clear passageway for strands to grow. One last way jojoba oil can be beneficial to hair health is by repairing strands damaged by heat and styling. Jojoba oil fills in the cracks and imperfections along the hair cuticle and also helps to seal split ends. Furthermore, the oil boasts calming properties so it conditions and softens strands, leaving you with a smooth, silky finish.